It's back from the dead! Today, Land Rover has announced a limited edition of the iconic Defender to celebrate the marque's 70th anniversary. The Defender Works V8 pays homage to the early high-powered engines found in older models, with a V8 engine which produces 400 bph. That makes it the most powerful and fastest version of the Defender Land Rover has ever produced, capable of accelerating from 0-60mph in 5.6 seconds, and onto a top speed of 106mph. Land Rover hasn't just focused on the engine. The V8 powertrain will be complemented by an eight-speed ZF automatic gearbox (yes, with a Sport Mode), uprated brakes, and a handling kit. The handling kit includes new springs, dampers and anti-roll bars. It'll sit on exclusive 18-inch diamond-turned Sawtooth alloy wheels and 265/65 R18 all-terrain tyres. The Works V8 with be available in eight standard body colours, including two satin finishes, and a contrasting with a Santorini Black roof, wheel arches and front grille. It's finished off with machined aluminium door handles, fuel filler cap and Defender bonnet lettering, as well as a lighting upgrade which includes bi-LED headlamps. The interior is trimmed with full Windsor leather, covering the the dashboard, door panels, headlining and Recaro sports seats. Land Rover Classic’s own Classic Infotainment System is also fitted - with sat nav as standard. 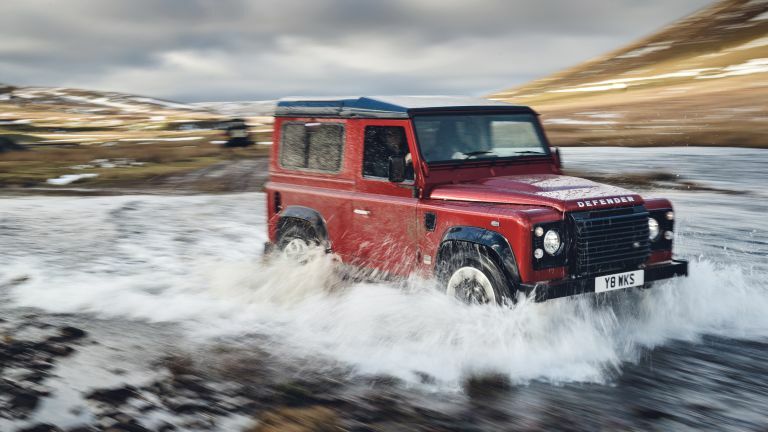 Both 90 and 110 wheelbase Defender Works V8 models will be available to purchase direct from Land Rover Classic, with prices starting from £150,000 for a 90 in the UK. There will be just 150 specially-selected and re-engineered vehicles. It's immensely cool, and instantly had us looking to remortgage the house. If you'd like to upgrade your current Defender, a select number of high-performance upgrades will also be available to purchase from Land Rover Classic, including power upgrades for the TDCi diesel engine, fast-road suspension and braking kits. Of course, this isn't to be confused with the all-new Defender, which is expected to be announced later in the year.